"This week I've been able to spend some (supervised) time with actual prototype Windows Phone 7 devices. I can say with utter confidence that I will be using one of these phones as my regular device before the end of this year. You all know I don't say something like that lightly." I ran across this blog post somewhat at random, but it's an interesting read from someone who's an iPhone user, yet is intensely interested in what Windows Phone 7 has to offer. It's a good read. Isn't it ironic , these "great" news about Windows Phone come out on the date first IPhones hit the market? This blog, Engadget, other websites as well. It's like MS begging: "Please, wait for us! Don't buy iPhone! Please!!!" But what do they have to offer besides flashy UI? Not much. I can live without Facebook and twitter all at one. Certainly, I don't give a Rat's behind about "Xbox integration". What's left besides "Office"? Nothing much. Plus absence of such vital OS functions S.A. cut/paste,multitasking and this is it, I lost interest completely! All is left to do, just to wait for Samsung Galaxy S to come toT-Mobile USA. Bye-bye Windows Mobile, or Phone, or whatever. One thing phone OS and hardware manufacturers should have learned by now is that "one size" never fits all. (Actually one size is equally non-fitting for all ) The ways that each so called killer device doesn't fit depends on the person doing the review. We all have different criteria and place different weights on the criteria we might agree on. Apples looks to have made great headway by engaging in self-fulfilling prophecies when it comes to iPhone (and iPad) sales, but any but the most ardent fan-boys will grudgingly note the short-comings of their device with the wishful thinking that Apple will probably fix it in an up-coming release. It sure looks like Microsoft is heading down the same path, but they lack the zealot base that Apple can count on. Android, on the other hand, is wide open the way that WM used to be. Developers have access to just about anything. (The app installers actually warn you when you that an app will be accessing various system resources). HTC and third parties have all manner of overlays and add-ons to tweak the UI and add functionality. The obvious "problem" is that you can never be sure whether even someone who owns exactly the same phone as you do will have the same "experience." We've got four Evos in my department at work and we're always talking back-and-forth about this or that add-on. Truth be told, I'm a tweaker and I love this sort of thing, but I can understand that there are many who don't. It strikes me that the author of the piece is the second type. He'd like a shiny-smooth UI with no surprises and he's certainly entitled to seek a phone that matches that criteria. Obviously, that same criteria doesn't work at all for me. I want a phone that's radically extensible. There appears to be only one OS choice that will continue to meet that criteria. I was surprise by the author's comment about what he calls "convergence." 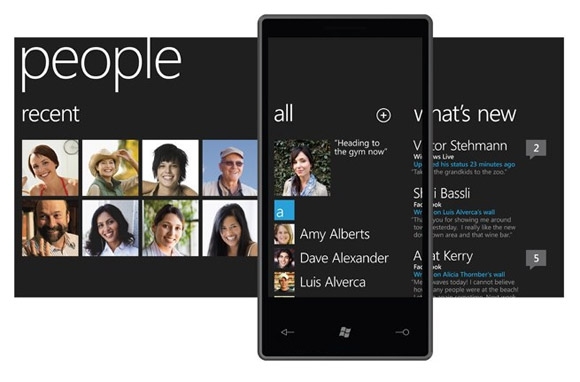 The reson is that I've noticed the same sort of thing he was touting in WP7 in my Evo. For example, I put in my Facebook login and, without any extra work, all the facebook avatars no appear in my "people" applet. I don't have to wait for WP7. I can do that now.